The film is presented like a symphony – in fact, there is an epic soundtrack pervasively scored through the entire movie (by James Newton Howard). The situation on that French beach in 1940 couldn’t have been worse for the early efforts of the BEF (British Expeditionary Force) versus the German army during the Battle of France. Their armies were trapped, with no way of getting to safe harbor, achingly close (40-80 nautical miles) to home across the English Channel. Enter the “small ships of Dunkirk,” a loose collection of pleasure crafts and fishing boats rounded up for the evacuation effort. 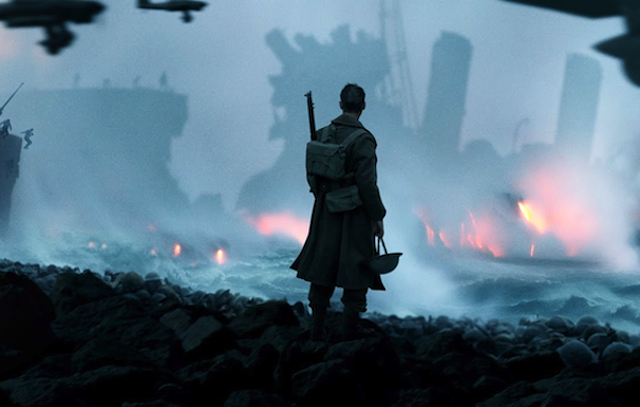 Director Nolan provides several points of view in this event – from the air, sea and ground – particularly through one British private who goes through hell and back to survive. Although it could be characterized as too much hyperbole, the grand scale of the situation, combined with the humanity of the evacuees, combined to make this an operatic and rich war-is-hell film. The 1940 Battle of France is going poorly for the early World War II Allies… the British, French and Belgium forces. The armies get surrounded near a French beachhead named Dunkirk, across the English Channel from Britain. German bombers have the nearly 400,000 men pinned down, including a hapless private named Tommy (Fionn Whitehead) who can’t seem to find safety. 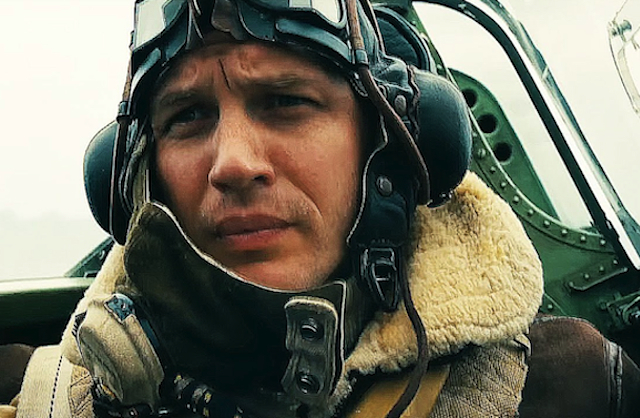 Meanwhile, the few battleships that are in the “mole” (Dunkirk harbor) are being smashed to smithereens, despite the efforts of air gunners Farrier (Tom Hardy) and Collins (Jack Lowden). It’s up to the “little ships of Dunkirk” to evacuate the mass armies, and one of those pleasure crafts is piloted by Mr. Dawson (Mark Rylance), his teen son Peter (Tom-Glynn Carney) and his friend George (Barry Keoghan). Their “finest hour” is about to begin. This is an old fashioned war film, with the epic scope of the overall Dunkirk scene interspersed with the smaller stories of humanity. And it is done passionately, with each story colliding into each other, and the use of one soldier as a thread from beginning to end a vital part of the storytelling method. It’s also done with little dialogue… the action itself becomes the basis for the re-creation, and the heroics or dread is how it unfolds. Each subset of actors involved in their personal experience becomes integrated into the whole, and Director Nolan (who also wrote the screenplay) displays his veteran hand in making it all work together. While not an “all-star” cast like the WWII films of old – think “The Longest Day” – there are some nice bits of casting here and there, including the always unsinkable Kenneth Branagh as Commander Bolton, James D’Arcy as Colonel Winnant, Tom Hardy as pilot Farrier and pop star Harry Styles as Alex. The stiff upper lip of Mark Rylance is essential for the pleasure craft captain, and newcomer Jack Lowden does some nice work as the other British pilot named Collins. Getting a buy-in from the young British cast, several generations removed from the conflict, was crucial in making the story work. Some of the more effective moments include a inside view of a torpedo hit – everything is fine and suddenly all are underwater – and the air battle sequences. In some markets, the film will play in 70mm widescreen (in Chicago, at the Music Box Theatre, see below), and it might be worth checking that out because of the epic wonder of the filmmaking. But in the end it’s the humanity that makes this work, set against a backdrop that is horrible in its circumstance, but vital in the inspiration it provided for an already war-weary British populace… and there were STILL four years to go. NOTE: Two other films that deal somewhat with the Dunkirk evacuation include the Oscar-winning Best Picture “Mrs. Miniver” (1942) and this year’s excellent and wry comedy/drama “Their Finest,” now available on digital/DVD. The Music Box Theatre, 3733 North Southport Avenue in Chicago, will present a special premiere of “Dunkirk” in 70mm at 7:30pm on Thursday, July 20th, 2017, in anticipation of a two week run. Click here for more details and ticket information.